Francesco Gessi. 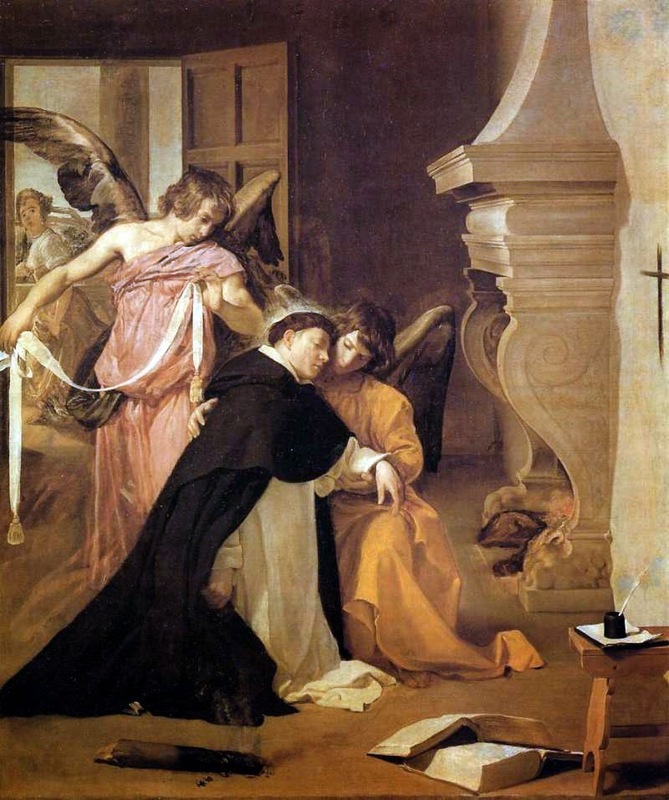 Temptation of Saint Thomas Aquinas. THE holy body was reverently carried beyond the cloister for the consolation of the Countess Francesca and female friends, after which it was laid out in the choir, with the face exposed. A great concourse of the faithful flocked to the church; such as were not permitted to enter the chancel touched the coffin with olive branches, which they kept as relics. The Requiem Mass was sung by the Bishop of Terracina, who was a Franciscan, in the presence of the Abbot and Cistercians, the Friars Preachers and Friars Minor. Father Reginald of Piperno pronounced the funeral discourse, broken with sobs, as he removed the veil which had concealed a life of consummate holiness. At its conclusion he made formal protest that he only left the body until further arrangements should be made by the Master General of the Order. Then, amid a universal wail, the earthly shrine of Thomas Aquinas was removed, and buried in a vault under the high altar. When tidings of his death reached Lyons, the Pope and Cardinals were filled with profound grief; the Holy Father ordered his treatise “Against the Errors of the Greeks” to be sent on to the Council. The saying of Eliphaz, recorded in Job v. 26, was realized in Saint Thomas. “Thou shalt enter into the grave in abundance, as a sheaf of wheat which is brought in its season”. The Cistercians of Fossa Nuova saw a great light over the Abbey for three days, which passed away at his death. The same marvel was beheld over the Dominican priory at Cologne. At the moment of his death one of the Cistercians engaged in prayer in the Abbey church saw Saint Thomas’s soul mount to heaven like a radiant star. At Anagni, Father Raymund Maturi, while asleep a few nights after this, had a vision in which he saw Saint Thomas, duly vested, proceed to the altar and say mass. What struck him as singular was the fact that his right eye appeared to be larger than the other. The saint explained the wonder, with these words: “My son, the knowledge which I enjoy in heaven is greater than what I had on earth, just as my right eye is greater than my left one”. God revealed the saint’s glory by very many miracles, ninety-six of which were duly attested, and submitted as evidence for his canonization. While his body lay exposed in the Abbey Choir, the Subprior, John de Ferentino, who was completely blind, placed his eyes against those of the saint, and instantly saw. The holy Doctor’s cell in Naples became a resort of pilgrims, one of whom, the renowned Egidius Romanus, uttered the phrase: “I am come to adore in the place where his feet have stood”. Master Albert of Cologne could never hear his name mentioned without breaking into tears. Learning that his doctrine was impugned in Paris, although over 80 years of age, he proceeded thither on foot with Hugh de Lucca in 1276, and defended Saint Thomas’s teaching warmly before the University. “What a glory it is,” he exclaimed, “for the living to be praised by the dead!” After representing the saint as being endowed with life while all others were covered with the shades of death, he poured forth a splendid eulogy of his doctrines as resplendent with orthodoxy and piety, and declared himself ready to meet any opponent. He did the same at Cologne, declaring that by his writings Thomas had laboured for all to the end of time. Owing to the pressure of Church affairs of graver importance, little beyond collecting of evidence was done towards the canonization under the brief pontificates of the Dominican Popes, Blessed Innocent V, and Blessed Benedict XI. Innocent spoke of him in terms of no common praise: “The teaching of this Doctor beyond all others has fitness of terms, manner of expression, and soundness of opinions; so that he who holds it will never swerve from the path of truth: while, on the contrary, he who attacks it must always be suspected”. Benedict invariably styled him: “My Master; my Doctor”. The solemn process of canonization was begun in 1318, promoted by Robert, King of Sicily, and supported by petitions from the Universities, the hierarchy, clergy, and the Order of Preachers. The official testimonies to be presented to the Pope at Avignon were entrusted to Friars William de Tocco and Robert de Benevento; as they were proceeding to France by sea, a great storm arose, and the ship was being carried towards the rocks, when they prayed aloud to Saint Thomas to preserve them; the wind then veered round, and they reached land safely. On delivering up the documents, Pope John XXII accepted them eagerly, and thus addressed the prelates and friars: “We do not doubt that Br. Thomas is already glorious in heaven, his life having been saintly, and his doctrine miraculous”. Three days later, in Consistory, he again reverted to it. “Venerable Brethren: We deem it a great glory for ourselves and for the whole Church, to inscribe this servant of God in the catalogue of the saints.” The decree was then read introducing the cause of canonization, and three prelates appointed as Commissioners to examine the evidence of miracles; these were Humbert, Archbishop of Naples; Angelo, Bishop of Viterbo, and Pandulf, an Apostolic Notary. Heaven now aided the cause by striking miracles. 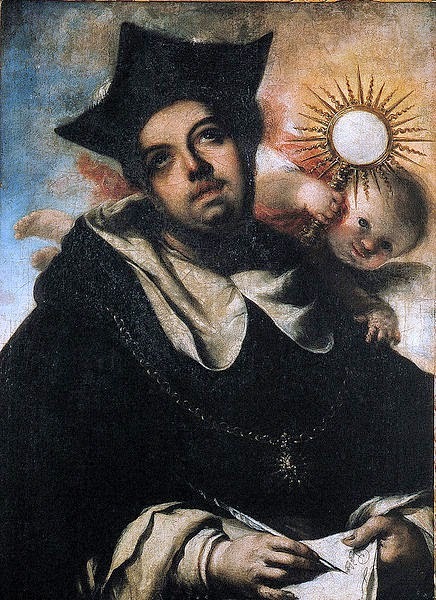 The Archbishop of Naples was suffering from an incurable ulcer: he now commended himself to the saint’s intercession before retiring to rest, and in the morning it was gone, leaving only a red mark. The Bishop of Viterbo fell ill of a violent fever, and lay at the point of death: he also prayed with confidence to the Angelic Doctor, slept peacefully, and awoke in perfect health. The same thing happened to Matthew, the chaplain of the Archbishop of Naples. Two further Commissions sat, at Naples and at Fossa Nuova, to substantiate the evidence of miracles. While these reports were being examined at Avignon, another singular miracle was wrought by the saint’s intercession. Mary d’Arnaud, the Pope’s niece, lay at the point of death from dropsy, so the Holy Father sent her the last blessing by the Bishop of Lodevi. It so chanced that the Bishop was a Dominican, who recommended her to have recourse to Saint Thomas. She did so fervently, and during the night saw some one draw nigh to her bed, whom she took to be the Bishop. “Do you wish to be cured?” asked the visitor. 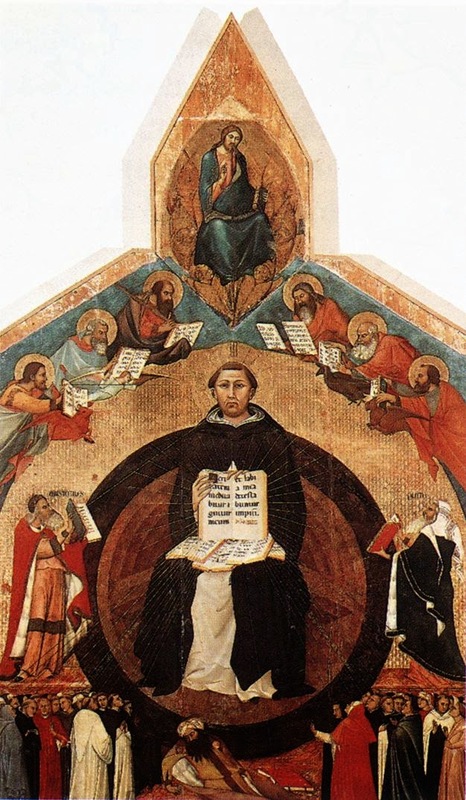 “I am not the Bishop, but Brother Thomas Aquinas, to whom you have had recourse: fulfil the vow you have made, and you will recover.” In the morning she found herself in perfect health. Three Dominican Cardinals completed the final stages of the process with zeal and fervour: these were Nicholas Aubertin, Nicholas de Freauville, and William de Godieu. The day appointed for Saint Thomas’s canonization was 18 July, 1323. The preliminary ceremony began in the Dominican Church in Avignon on the day before, in the presence of Pope John XXII, the Cardinals, very many Archbishops and Bishops, King Robert of Sicily, his mother Queen Mary, many princes, nobles, and ambassadors. The Pope pronounced a grand eulogium of the saint’s works and merits, grounded on this text: “This is a day of good tidings: if we hold our peace, and do not tell it to the morning, we shall be charged with crime: come, let us go and tell it in the King’s court” (4 Kings vii. 9). King Robert of Sicily, a relative of the saint, then gave an address, showing how Saint Thomas had merited the honour bestowed, because he had been, and would ever continue to be, “a burning and a shining light” (St. John V. 35). The Archbishop of Capua followed with a panegyric, who was succeeded by Father Raymund Bequin, the Master of the Sacred Palace; further orations were delivered by the Archbishop of Arles, the Bishops of London, Winchester, and others.